This paper will present the methodology, argument, and some case studies from the book of the same title, which will be launched following the seminar at Blackwell’s bookshop. The talk will also demonstrate the innovative features of the book’s e-book edition. 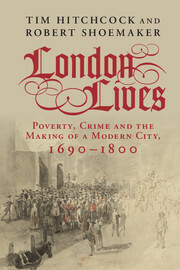 The book charts the experiences of hundreds of thousands of Londoners who found themselves submerged in poverty or prosecuted for crime, and argues that through their responses plebeian Londoners influenced the pace and direction of social policy in the eighteenth century. The book illuminates the lives of prison escapees, expert manipulators of the poor relief system, celebrity highwaymen, lone mothers and vagrants, revealing how they each played the system to the best of their ability. In their acts of desperation, the authors argue that the poor and criminal exercised a profound and effective form of agency that changed the system itself, and shaped the evolution of the modern state. Tim Hitchcock is Professor of Digital History at the University of Susssex; Bob Shoemaker is Professor of Eighteenth-Century British History at Sheffield. In addition to their individual publications, Tim and Bob co-directed Old Bailey Online and a series of successor projects in digital history. In 2011 they were the winners of the History Today/Longman Trustees Award for their ‘major contribution to history’ for the ‘groundbreaking’ Old Bailey and London Lives projects ‘that point the way to the future of the discipline’.